1) Kicking Bear invokes the ideology behind the U.S. government’s expansionist policies (divine right and chosen people), but from the point of view of the Native Americans who were displaced by the colonizers. 2) The speech uses familial rhetoric (words such as “brothers” and “fathers”) to forge unity among diverse tribes, linking the past, present, and future of the Pan-Indian Movement. Specifically, Kicking Bear promotes a communal undertaking, the Ghost Dance, to reach a common goal for the future of the Native Americans rooted in the shared past of their ancestors. Kicking Bear, as a spiritual and political leader of the Sioux, seeks to persuade his audience that 1) Natives are the chosen people to populate the land, and 2) tribes must join together in the Ghost Dance to bring the return of the land back to the Natives. The structure of the speech utilizes a journey story, common in oral tradition, to develop its points. First, Kicking Bear leaves the farm reservation on horseback; then he is taken into the sky and given spiritual information about the chosen nature of the Natives; last, he returns home to spread the news of the salvation of the Natives through the Ghost Dance. Provide students with this short excerpt from Samuel Danforth’s “A Brief Recognition of New England’s Errand into the Wilderness: “You [Puritans] have solemnly professed before God, Angels, and Men that the Cause of your leaving your Country, Kindred, and Fathers’ houses, and transporting your selves….over the vast Ocean into this waste and howling Wilderness was your liberty to walk in the faith of the Gospel, and your enjoyment of the pure worship of God according to his institution.” Ask students to identify what assumptions Danforth makes in his argument (e.g. about the state of the U.S. land, the nature of the Puritans’ mission, etc). 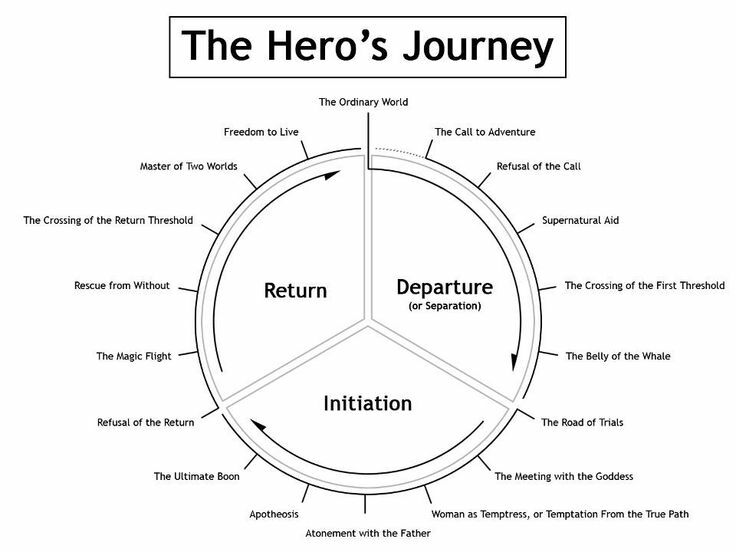 Have students consider this simplified infographic based on the work of anthropologist Joseph Campbell on the structure of the hero’s journey: https://s-media-cache-ak0.pinimg.com/736x/f6/a1/6a/f6a16a1b6b3aba6a42ba81c25eed6d89.jpg Students can identify stories (in books, movies, etc) that follow the three-part structure of “Departure, Initiation, and Return.” Have students consider: What is the purpose of each part of the journey? Listen to this recording made in 1894 of singing from a Ghost Dance ritual http://memory.loc.gov/cgi-bin/query/r?ammem/berl:@field(NUMBER+@band(berl+13LWO8861l)). Based on this short recording, have students anticipate the purpose and/or tone of the Ghost Dance. Was it spiritual, cultural, political, or something else altogether? Based on their thoughts, have them consider whether the Pan-Indian movement can be considered a social movement, such as Women’s Rights or Civil Rights. How is it different? How is it the same? The Ghosts [throughout]: Kicking Bear makes continual reference to “the ghosts,” the ancestors of the Natives. He uses the ghosts as a means of remembering the collective Native past, a time free of white man, as a promise to return to a future in which the land again belongs to the Natives and is replete with buffalo. In this way, the ghosts serve a practical purpose of uniting the Natives in addition to the religious purpose of spreading word of the Ghost Dance to Kicking Bear. The Red Nations [para 6]: Kicking Bear refers generically to Native tribes as “the red nations.” By the 1870s and 1880s, many tribes lived in fragmented and mixed communities on reservations. This generic term unites these fragmented tribes and gives them a sense of political agency. Students will assess the language of the speech (religious and familial) and relate it to the purpose of the speech: to unite the Natives, spread the word of the Ghost Dance, and herald a new beginning to the red nations. Students will identify the first two stages of the journey structure and connect this structure to the intended audience of the speech: Natives who share knowledge through oral tradition and mythology. Students will analyze how Kicking Bear uses language to make himself into a prophet for the Pan-Indian movement. Students will identify the final stage of the narrative structure, “The Return,” and how it empowers Natives to take up the cause of the Ghost Dance. Paragraph 1: Discuss with students the purpose of Kicking Bear’s address. Who is the audience? What patterns do they notice in his use of language? From the very beginning of his address, who or what does Kicking Bear’s language honor? Paragraph 2: This passage contains the first phase of the journey story: the Departure. Why does Kicking Bear say he left the reservation? How does this paragraph continue the themes students identified in the introductory paragraph? Paragraph 3: Here Kicking Bear begins the Initiation, wherein he is welcomed into the sky with the Great Spirit and his wife. What phrases indicate that the Natives have the right to this land? What is Kicking Bear shown? Paragraph 6: The final passage focuses on empowering the Natives. How does Kicking Bear accomplish this? He returns to the point that the Natives are the chosen people, and that the future belongs to them if they spread the dances taught to them by the Great Spirit. The speech culminates with final stage of the journey, the Return, in which the divine knowledge from the sky is brought to “our people” (the Native tribes) in a promise of salvation free from the oppression of white man. Issues of translation and authenticity are important when reading and critiquing American Indian discourse from the nineteenth century. Native speeches were interpreted by translators, either Native or from the U.S. government, and were then recorded in writing. What are the problems with this process? Does the way you think about the process change depending on whether the translator is Native or governmental? If authenticity is rarely a certainty when reading these texts, how do we go about studying them ethically and thoroughly? Using your textbook or academic websites, look up the term “social movement” and prepare to discuss whether you think the Ghost Dance fits into the definition’s parameters. The Ghost Dance was revived by the American Indian Movement in the 1960s and 1970s, culminating in violence during the occupation of Wounded Knee, South Dakota, by activists from the American Indiana Movement in 1973. Have students watch this three-minute preview by PBS of the incident http://www.pbs.org/wgbh/amex/weshallremain/the_films/episode_5_trailer What arguments do they hear Natives make? What arguments do they hear the U.S. Government make? How do these arguments vary from the discourse of the late 1800s? Locate the websites of senators and representatives in states that support large American Indian populations (i.e., Oklahoma, South Dakota, New Mexico, Arizona). What issues related to Native culture and U.S.-Native relations do they discuss? What types of legislation have they proposed (or are they currently sponsoring) regarding American Indians?